In three years of hard work we fitted out the Dutch-built steel hull. Before it was time to varnish mahogany and sew upholstery, many an hour was invested in work that is never seen afterwards - casting lead bars for ballast, fitting tanks, wiring, drilling holes and cutting threads, etc. The work was worthwhile however, for now we know we have a yacht we can rely on. 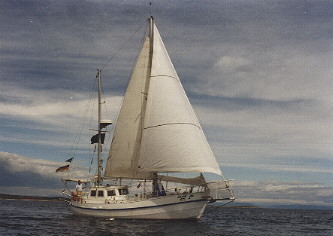 In 1983 the ketch was named ARION and sailed initially in the Adriatic. From 1988 to 1994 we went off on our big trip and returned home loaded with memories, photos and videos. If you'd like to know why we named the boat ARION - well, we liked the story. And if you don't happen to have a book of classical stories, we've found it on the Internet. Read the story for yourselves. Arion is now in Croatia - and you can come sailing with us. The yacht has a fore and aft cabin with three bunks in each, a washroom with toilet, and a U-shaped dinette with the galley opposite. The navigational equipment is located in the wheelhouse and comprises log, echosounder, compass display, VHF radio, Loran C, Robertson Autopilot, GPS, radar, short wave transmitter. Under the wheelhouse the engine room contains a Perkins 50 hp diesel motor, diesel tanks for 450 litres, hot water boiler (1,000 l fresh water on board) and the batteries for the 12, 24 und 220 V power supplies. The batteries are charged by a solar panel and by the engine which also provides the hot water and the refrigeration if it runs about 30 minutes a day. The yacht has everything you need on holiday - after all, she we lived aboard for 6 years! This is no "bare"boat charter yacht but a home. Our homepage has details of this season's sailing plan - book early, particularly if you want to come in the main season!